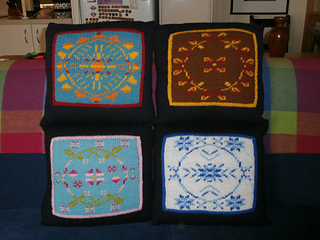 Four cushions, one to celebrate each season. 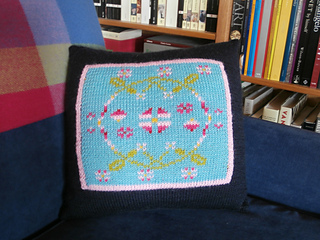 These colourful cushions are made using a combination of single and double knitting with intarsia joins, so there’s plenty to keep seasoned knitters occupied. But a beginner could start slowly with winter and work their way up to spring. Best of all, there’s no need to sew in the ends! 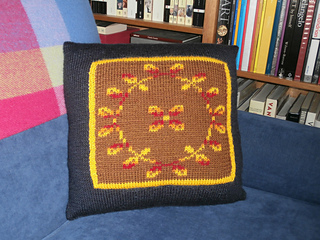 The finished cushions are 40 centimetres (16 inches) square. 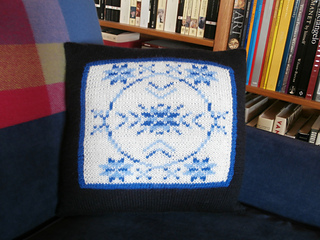 You will need substantial quantities only of your main cushion colour (navy blue here) – 4 balls per cushion or 13 balls for all four – and a whole ball for the frame colour (going around the picture on each cushion). 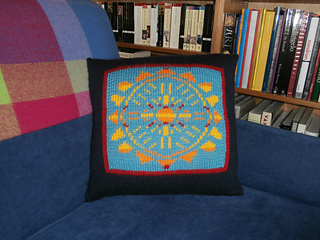 The lower yardage given here is for one cushion using all new balls; the higher yardage is for all four cushions using all new balls. 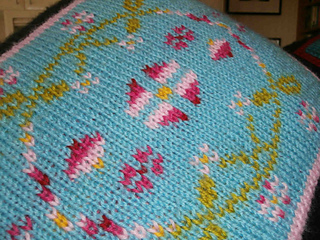 You could use scraps and half-balls for most of the other colours if you have them. 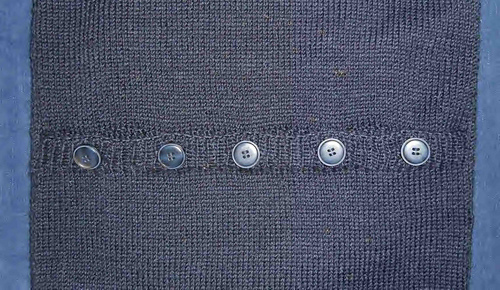 You will also need 5 × 23 millimetre (7⁄8 inch) buttons per cushion and a 40 centimetre (16 inch) square cushion insert per cushion. 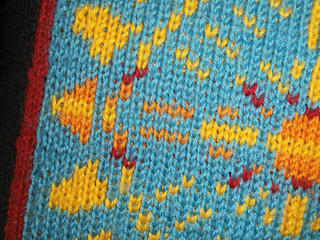 The samples were knitted in Morris Estate 8 ply (available at http://morrisandsons.com.au/c1_341_1694) but the pattern also provides suggestions for the more readily available Cascade 220 Sport.